It is acceptable to use a spring between the antenna and the molded M-2 side mount. Just remember this. The base diameter of most springs, including all Firestik models, is larger than the cut-away on the top of the M-2. 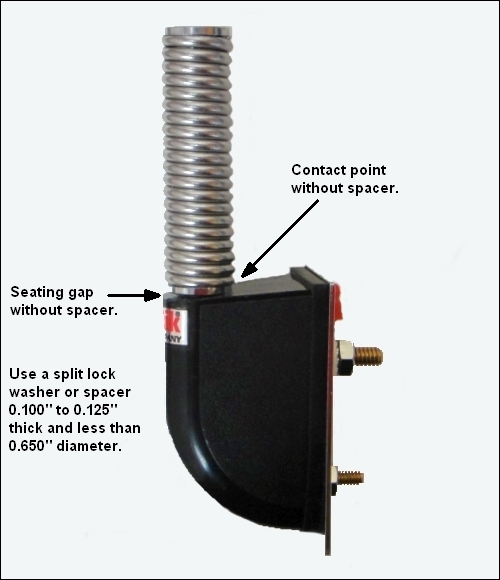 So, if you are going to use a spring use a split lock washer or a spacer (washers) in the 0.100" to 0.125" range. If you do not, the base of the spring will contact the plastic on the M-2 before it fully seats against the brass insert on the top. Under those conditions, the spring could vibrate loose and you could lose the antenna and spring. Also, without the spacer in place, tightening the spring will at least chip the plastic and possibly fracture the mounts housing.